Creating an animated is one of the unique way to grab attention of the reader. 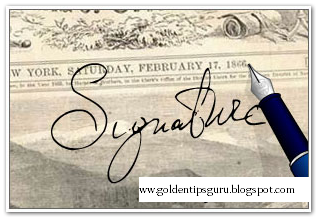 Signatures play a vital role in email and other social network in modern days. See to that you make a unique and pleasant signature. Please avoid using irritating colors it will surely spoil your readers mood. In this tutorial I will explain in detail how to create Animated signature using Adobe photoshop and Imageready software. 1. The signature consist of an animated object. 2. Its moving ,yeah thats what it makes look like animated. 3. Observe more carefully the signature consist of frames. 4. After each frame the body moves. 5. Note the speed its uniform. 6. Frames are interlaced and transparent that what cause moments if its stuck the sig wont look nice. 1. Open Photoshop and create a new image file measuring 100 by 100 pixels. Set the resolution to 72 pixels per inch and the mode to RGB color. 2. Choose Show Layers from the Window menu. This will bring up the Layers floating palette. 3. Select the pencil tool. Use it to draw a picture. 4. Click on the Layer palette’s submenu arrow and select Duplicate Layer. 5. Click on the eyeball icon to the left of the bottom layer on the Layer palette. Use the pencil tool to add to the image on the top layer. Select the erase tool to remove part of the image. 6. Under the file menu, select Jump to, and then Adobe ImageReady . Save when prompted. 1. Choose Show Animation from the Window menu. This will bring up the Animation floating palette. 2. Click on the Animation palette’s submenu arrow and select Make Frames from Layers. 3. Use Save Optimized As to save the animation under a new name. 1. You can draw directly in ImageReady, which has nearly identical tools. 2. Preview your animation by pressing play on the Animation palette. 3. Add more unique frames for a richer animation. 4. Click on the time values at the bottom of each frame to adjust how long it will remain visible. For orkut signs make sure you keep the background as transparent. If u think that u are more advanced in doing all those add special effects like shadow blur,apply filters etc..
once a gif image is created. I hope you understood by that and i tried my level best to explain all this things to u with out omitting any steps.